Very prickly, scrambling, woody perennial shrub up to 2 m or more tall, bearing large white or pink flowers followed by black berries. Extremely variable in leaf shape and plant form. Flowers White to pink, 2-3 cm in diameter, with five petals and numerous stamens, in many-flowered clusters. Flowers Nov-Apr. Fruit Aggregated berries 10-15 mm long, red at first, turning black when ripe, made up of twenty to fifty two-seeded drupelets. Seeds widely spread by birds. Leaves Compound, three to five, oval, toothed leaflets arranged palmately. Stalks and mid-ribs prickly. Stems Up to 8 m long, arching, entangling, woody, armed with savage backward pointing thorns. Stems rooting at tips to form new plants. New stems grow from the base each year. Roots Stout, branched, creeping underground roots. Reverting land, scrub, road-sides, hedgerows, swamps and waste places. Common to locally abundant throughout NZ including Stewart and Chatham Islands. Originally from temperate northern hemisphere regions. Very common nuisance weed. 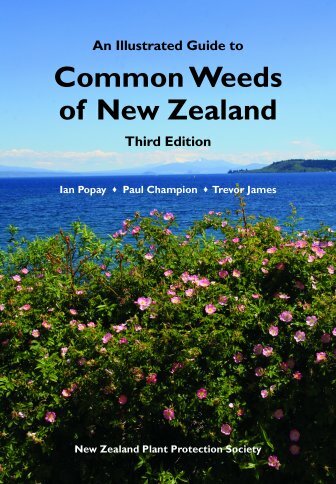 Can become a major weed of pastures in some areas, like Wairoa. A preferred food for goats, which control it effectively, but need to be confined with it. Otherwise, control can be difficult. Seedlings are very slow growing, and can be controlled by moderate grazing pressure. The species is extremely variable and has sometimes been divided into many species and very many varieties. One of the more distinctive, sometimes distinguished as a separate species, is cut-leaved blackberry (Rubus laciniatus). All blackberries are subject to Pest Plant Management Strategies in several regions of NZ. Details are available from individual regional councils or unitary authorities. Other species of Rubus include the native bush lawyers (Rubus australis, Rubus cissoides and Rubus schmidelioides), with long, semi-woody stems, sprawling or climbing in native forest and bush margins. They have backward-pointing spines that often hinder the progress of humans or animals through the bush. Rubus (Lat.) = bramble; fruticosus (Lat.) = bushy.